I often get messages from friends asking for skincare advice and what the best regimen would be to address their skin concerns. Immediately, their routine is transformed with the suggestion of three basic steps: cleanser, toner, and moisturizer. Masks, treatments and serums are the icing on the cake. I believe that everyone should at least have these steps down and if you don't, get ready for your natural glow to be magically changed forever. I'm so serious. Whenever I'm talking about toners, I always suggest rose or tea tree water. In March, I started using witch hazel toner, but rose toners are my absolute favorite. Interestingly, I'm never a fan of rose-y things unless it's in my skincare. 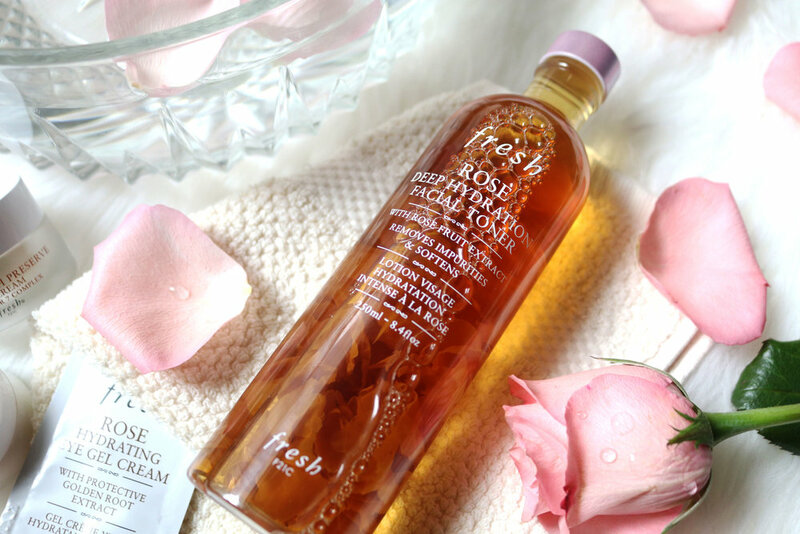 Fresh recently introduced the new Rose Deep Hydration Facial Toner to their rose collection and the packaging alone had me sold. The Formula | What's the difference? Rose Floral Toner ($40) | In my opinion, it's a lightweight and simpler formula. Simpler meaning more straightforward with pure rosewater. Not that the Deep Hydration Facial Toner is unbelievably heavy, but the Rose Floral Toner can be used to refresh the face during the day, set makeup, and prepare the skin for serums. Ingredients: Aqua (Water), Glycerin, Pentylene Glycol, Rosa Damascena Flower Water, Anthemis Nobilis Flower Oil, Sodium Citrate, Citric Acid, Citronellol, Geraniol, Phenoxyethanol. Rose Deep Hydration Facial Toner ($44) | This formula is more complex in a beautiful way and only slightly "heavier". While this facial toner also contains rosewater, there is rose fruit extract, rose flower oil, castor wax, and hyaluronic acid as well. It's even infused with real rose petals which you can see gracefully floating at the base of the bottle. Obviously, this one was made to put in work and offer all of the soothing, moisturizing benefits of rose. The prices are also very close. Only a $4 difference there. Choosing a routine to pair with specific products is like picking out an outfit to me! Sometimes other products are of the same brand or I figure they will pair well because of similar key ingredients, consistency, or my overall skincare goal at the moment. Open pores with a warm washcloth and apply cleanser of choice. Rinse with warm water to keep pores open. This changes depending the behavior of my skin, but Mario Badescu Acne Facial Cleanser is a favorite especially when my skin is being a bit temperamental. Apply a thin layer of the Fresh Rose Face Mask (sample) and let sit for 10-15 minutes. Rinse with warm water. Use a cotton ball or pad to apply the Fresh Rose Deep Hydration Facial Toner all over face. Allow to dry completely. Apply Derma e Hydrating Serum to face and Fresh Rose Hydrating Eye Gel Cream (sample) around eyes. Moisturize the entire face with the Fresh Lotus Youth Preserve Face Cream. Press into skin. Done. As soft and smooth as a rose petal! The Formula | I loved the formula for this toner! Honestly, it's probably the best toner I've used because there's more to it than just the typical rosewater and it's refreshing. Ingredients are important to me with each of my products and I believe that they have a lot to do with the performance. Think of your favorite face mask plus the Rose Deep Hydration Facial Toner as a deep conditioner for the skin -- the moisture is real. My skin isn't dry, but I think this would be an excellent option for someone with dry skin or who may need extra hydration during a certain time of the year. For me, rose masks are what I use to soothe my skin during the unbearable spring allergy season. A cold, refrigerated rose mask is a major key to fighting the puffiness and irritated skin. The Rose Deep Hydration Facial Toner is perfect to follow with. You won't be disappointed with this toner! My skin feels very soft and the overall texture is amazing. I recommend it! The Price | I'm a member of Fresh's rewards program, so I received a 15% off email just in time to treat myself to this goodie. For $44, I was praying it would be at least somewhat phenomenal and not like every other rose toner. I actually did quite a bit of comparing the Rose Facial Toner vs. the Deep Hydration Facial Toner (descriptions, benefits, and ingredients) before purchasing to figure out if it'd really be worth the money. Luckily, it was. However, I'm hoping the 8.4oz bottle will last me for a little while. Once I'm out, I will make a point to purchase again...but I'm certainly crossing my fingers for another Friends & Family coupon. The Results | My skin was fairly clear before using the Rose Deep Hydration Facial Toner, so I was not able to see any huge changes in my skin aside from the softness and smoothness. I did not experience any breakouts from using this product, and it didn't clash with any of my other products formula or scent-wise.